Olympus' highest peak, Mýtikas or the "Throne of Zeus"
Mount Olympus (Greek: Όλυμπος ; also transliterated as Ólympos, and on Greek maps, Óros Ólimbos) is the highest mountain range in Greece, its highest peak Mýtikas rising to 2,919 metres high (9,577 feet). Since its base is located at sea level, it is one of the highest peaks in Europe in terms of topographic prominence, the relative altitude from base to top. It is located in the borders of Thessaly and Macedonia, about 100 km away from Thessaloniki, Greece's second largest city. Mount Olympus is noted for its very rich flora with several endemic species. 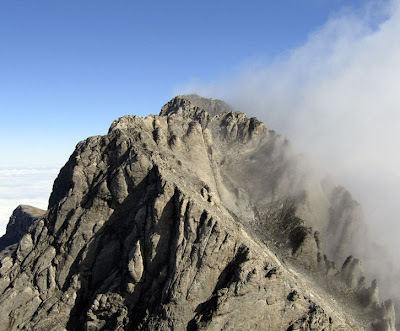 The highest peak on Mount Olympus is Mitikas at 2,919 metres high (9,577 feet), which in Greek means "nose" (an alternative transliterated spelling of this name is "Mytikas"). Mitikas is the highest peak in Greece, the second highest being Skolio (2912 m). In Greek mythology the mountain was regarded as the "home of the gods", specifically of the Twelve Olympians, the twelve principal gods of the ancient Hellenistic world. The Mount Olympus and the national Park around it was recently selected as main motif for a high value euro collectors' coin: the €10 Greek National Park Olympus commemorative coin, minted in 2005. On the reverse, the War of the Titans on Mount Olympus is portrayed along with flowering branches on the lower part of the coin. Above the scene is written, in Greek, "National Park Olympus", while on the bottom of the coin, close to the edge, is the issuing year.